Cheim & Read is pleased to announce their first exhibition of works by Jannis Kounellis. Jannis Kounellis was born in Piraeus, Greece in 1936. He moved to Rome in 1956, where he became a defining member of what came to be known as the Arte Povera movement in the 1960s. At this time, he was best known for creating striking combinations of organic and inorganic elements, and for contaminating conventional artistic structures with rebellious use of unconventional objects. In 1969, he created Untitled for Galleria L'Attico in Rome, positioning twelve living, breathing horses in a rectangular exhibition space; the work deconstructed set ideas of artistic practice and referenced the horse's long history of cultural and artistic representation. Kounellis strives to fuse the experience of art and life-to remove art from its hierarchical, modernist structure and reposition it in co-existence with everyday reality. In using substances related to an earthy and elemental nature-iron, cotton, coal, burlap, coffee, gold-as well as animate objects like birds, animals and fire, Kounellis produces multi-layered work that references cultural conditions (commerce, agriculture, trade), while maintaining poetic and often profound dichotomies between his chosen materials. Kounellis' work can be defined by metamorphosis-an alchemical transmutation of everyday objects. His exhibition spaces often reference a stage (or canvas), his installations a sort of theater, replete with an aura of spontaneity and drama. Contrasting materials become characters in an active dialectic, the apparent tensions between them (soft/hard, rigid/malleable, animate/unmoving, textured/smooth) providing an energetic and lyrical performance. 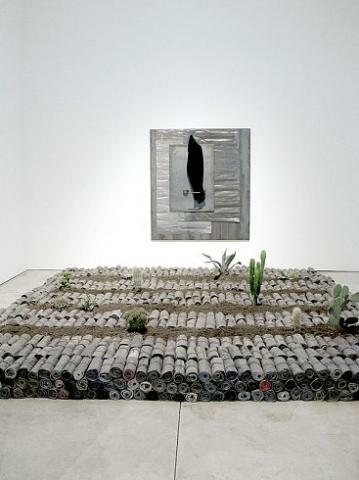 Kounellis' choice and placement of objects transforms them from mere items to elements of artistic resonance. This sense of transition and regeneration underscores a major theme of Kounellis' work: the exploratory journey and often nomadic traveling in one's search for self-identity. All works shown in Cheim & Read's exhibition are dated 2006, and continue Kounellis' investigation of elemental materials while enforcing a sense of the transient and transcendental. Anthropomorphic I-beams are wrapped, mummy-like, in discarded overcoats, trussed with wire and positioned on wire-grid beds. Shoes, worn and scuffed with age and muted in color, march together formally across the cold patina of a minimalist iron plate. Three beds are wrapped in canvas and painted in the color of dried blood, positioned as in a stage set. Overcoats, in repetition, push through holes cut in iron, their arms bound with wire in tight embrace, or perhaps handcuffed with political reference. Kounellis' use of personal artifacts-overcoats, shoes, beds-and their associations with physical travel suggest the props of a refugee. The familial objects have an implied narrative, a previous life now soberly defined by their exile and delineated by the contrast of their new surroundings. Kounellis' works are distinguished by a sort of homelessness, an unending and questioning search for a unity between art and life, and, more importantly, the dialogue between them.